We pride ourselves on the service we provide, see what our customers think. SULO NZ was formerly started as a partnership encouraging technology exchange between the award winning plastic injection moulding companies, SULO MGB Australia, located in Sydney Australia, and Talbot Technologies, located in Christchurch New Zealand. The commissioning of a new state of the art manufacturing facility, including installation of machinery and the construction of the company offices, in a building formerly used by Fisher and Paykel took just over three months. 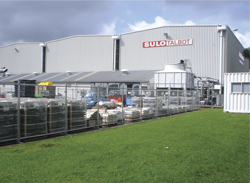 SULO Talbot commenced commercial production with a landmark order from Christchurch City Council for over 450,000 mobile garbage and recycling containers (MGBs) for a new 3-bin collection service that commenced in early 2009. At 2:08am on Friday 1 August 2008, SULO Talbot manufactured its first MGB and the facility continued operations on a 24 hour 7 day week basis. On the 3rd of October 2008 the site was officially opened by The Right Honorable Helen Clark, Prime Minister of New Zealand, with the official plaque being presented to Michael Huston of SULO MGB Australia and Steve Wilson of Talbot Technologies. In 2011 Talbot Technologies sold out of the partnership and currently maintains a close working relationship with SULO Talbot. SULO Talbot was re-branded as SULO (N.Z.) Limited mid 2014.